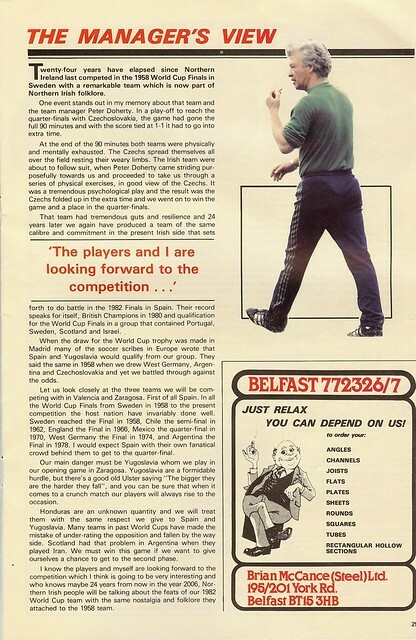 A curious thing came into my possession this week, ironically, on 25th June (You should know why that date is important) of a booklet previewing the 1982 World Cup for Northern Ireland. 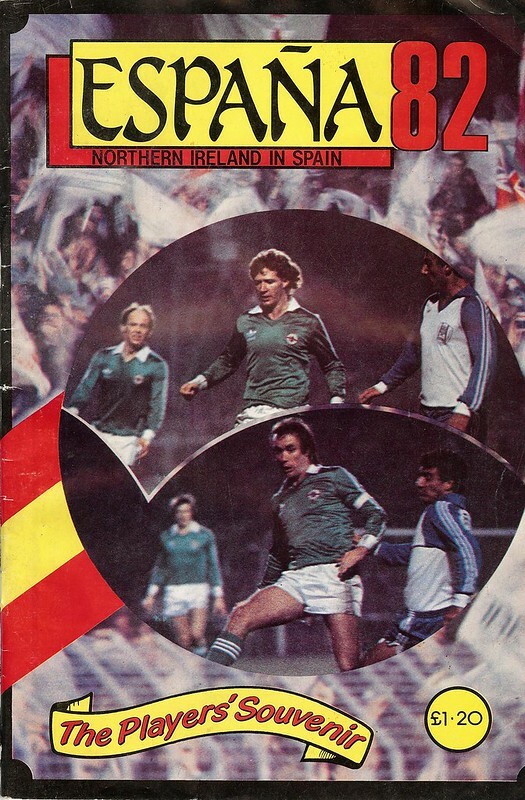 The front cover features match action from the 1-0 win over Israel in November 1981 that secured Northern Ireland’s qualification. 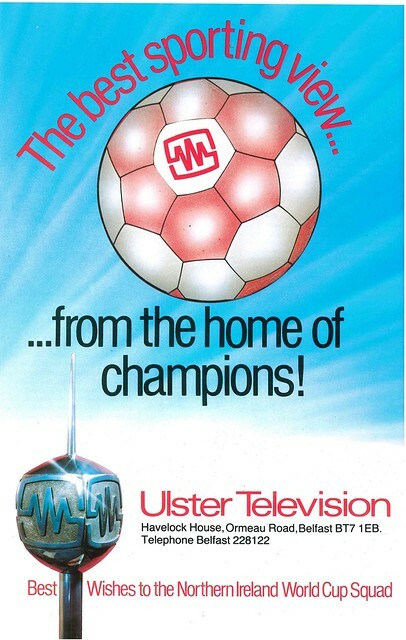 The brochure is edited by Billy Kennedy and Ivan Little, then Co-Editors of Linfield’s matchday programme, and also co-edited Northern Ireland’s programmes during that period. 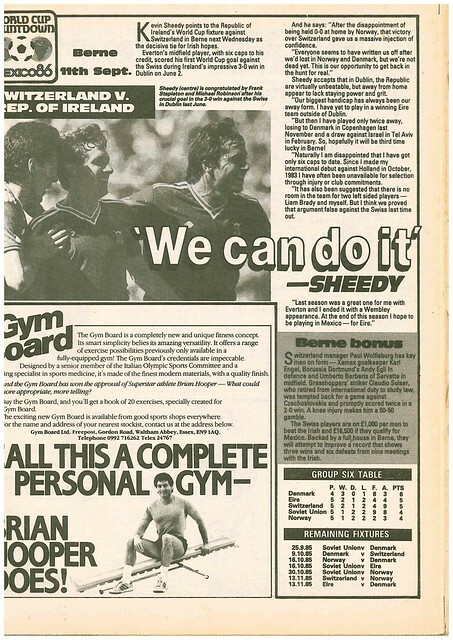 Billy Kennedy is still currently writing for the News Letter, while Ivan Little now has a weekly column for Sunday Life after a long career with UTV. 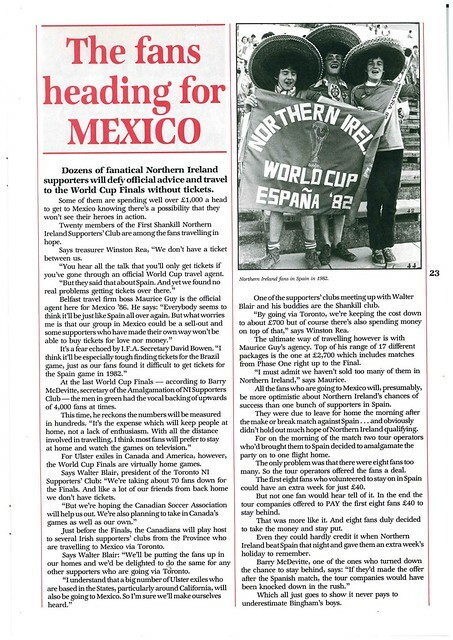 The editorial congratulates Northern Ireland on qualifying for the finals, pointing out that the groundwork to a successful campaign began in winning the 1980 Home Championship. 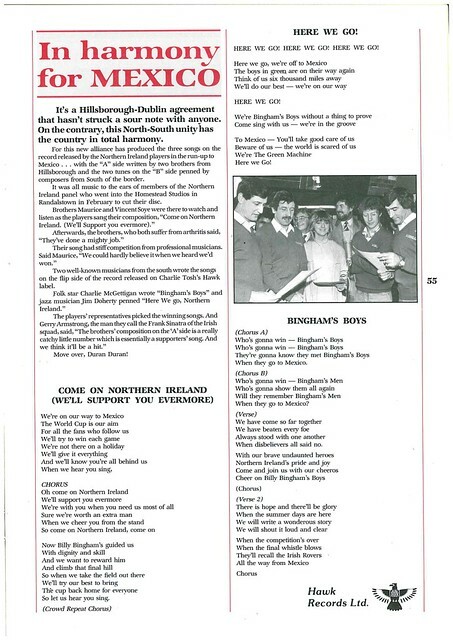 There is an editorial from Dr Michael Scott, Consultant Cardiologist at Belfast City Hospital, congratulating the team on it’s success, and pointing out the benefits of not smoking. 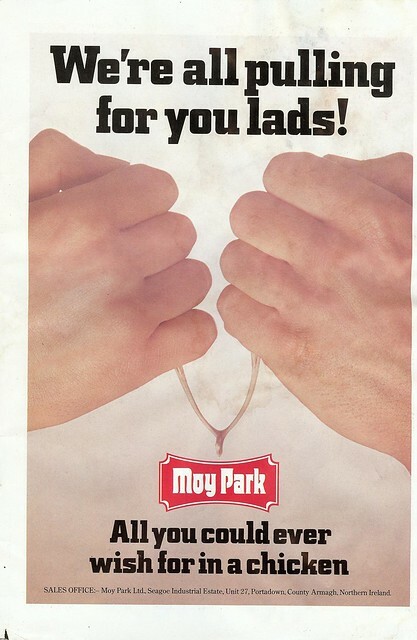 There are various anti smoking adverts in the publication from NI Chest Heart Stroke Association. 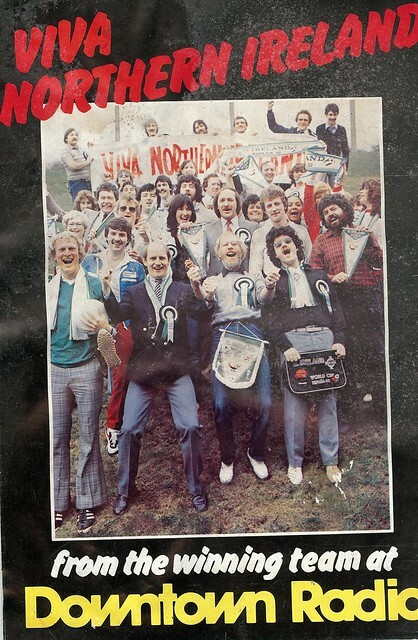 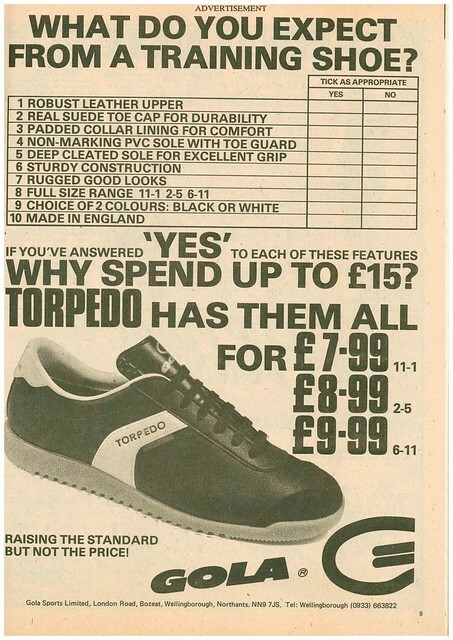 Despite the title, the publication was available to the public at a cost of £1.20. 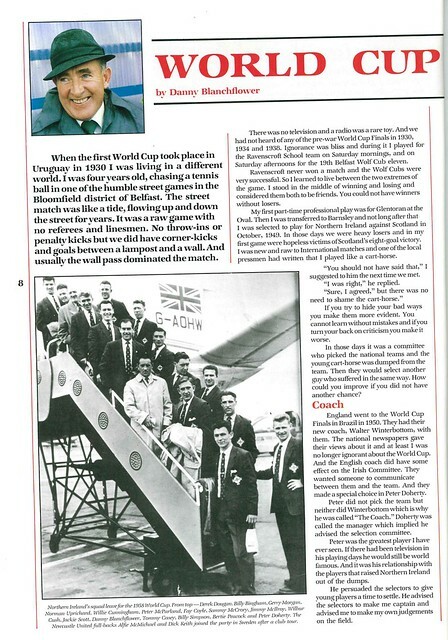 Malcolm Brodie writes about how the World Cup has changed during his time covering the event, especially since Northern Ireland’s last appearance, 24 years previously, in 1958. 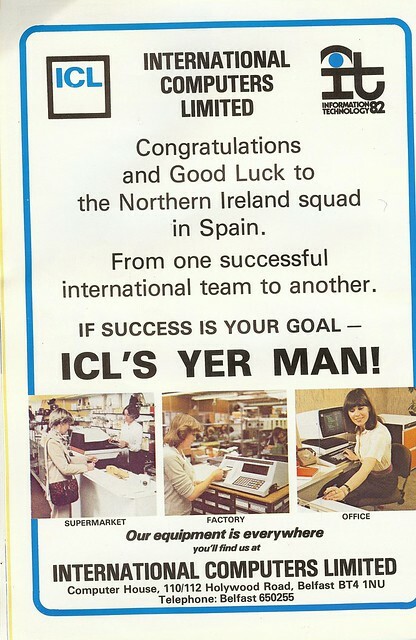 He notes that the tournament is now more commercialised, in his words, “It is big business, now on a global scale”, and about how there will be increased security surrounding all the teams in Spain. 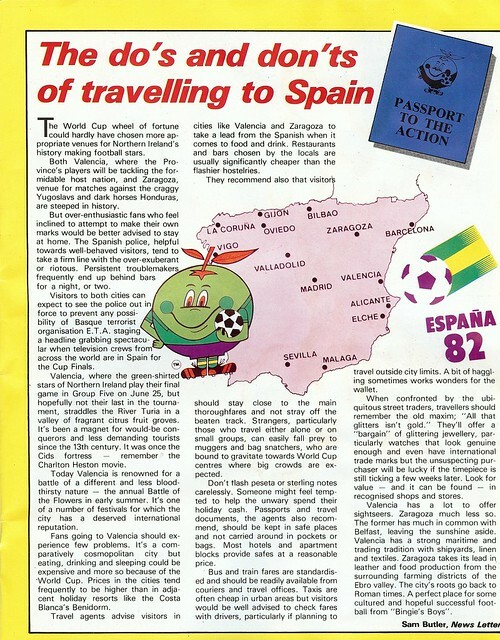 There were no Quarter-Finals in Spain 82, after the groups, there were 4 groups of 3. 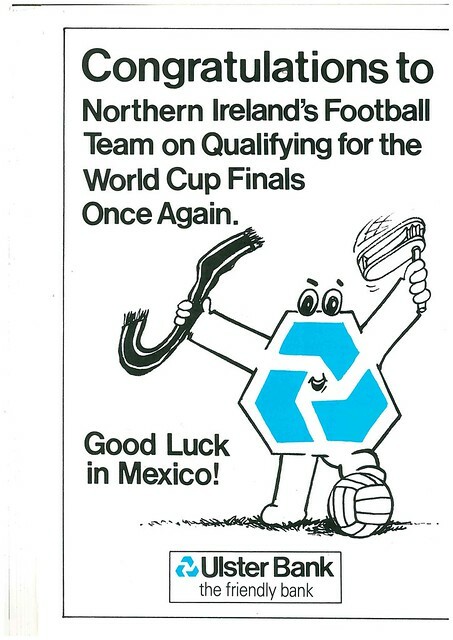 Northern Ireland were 1 win away from the Semi-Finals, so technically, it was a Quarter-Final of sorts. 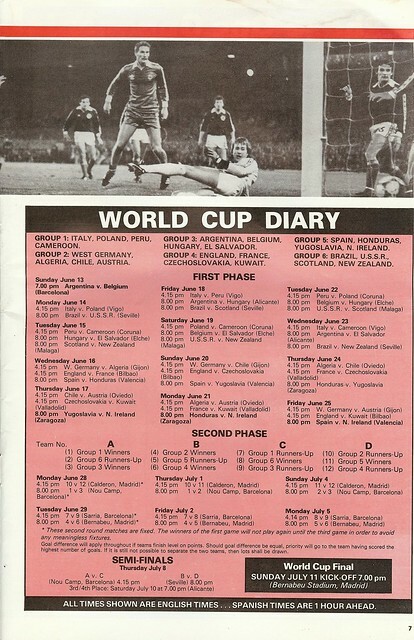 There was also a fixture list for the competition, with dates/venues/kick-off times. 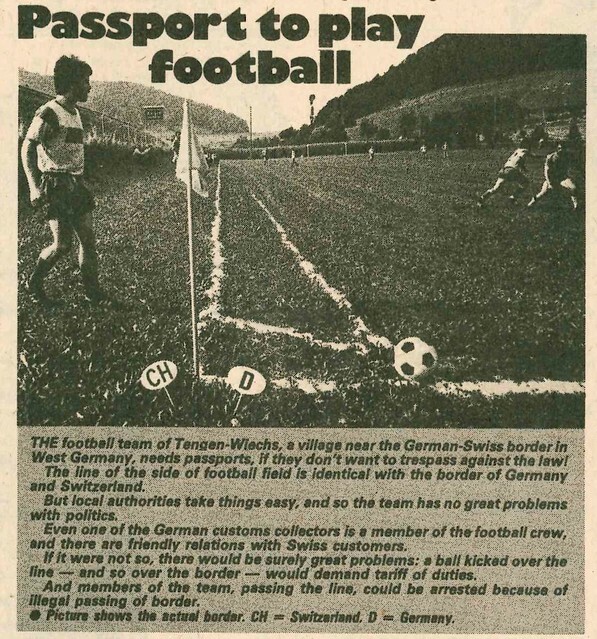 What struck me as odd was the volume of group games being played at the same time. 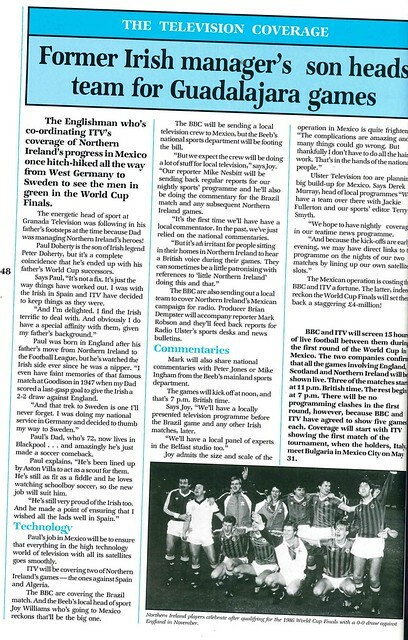 For example, Hungary v El Salvador in Group 3 was played at the same time as Scotland v New Zealand in Group 5. 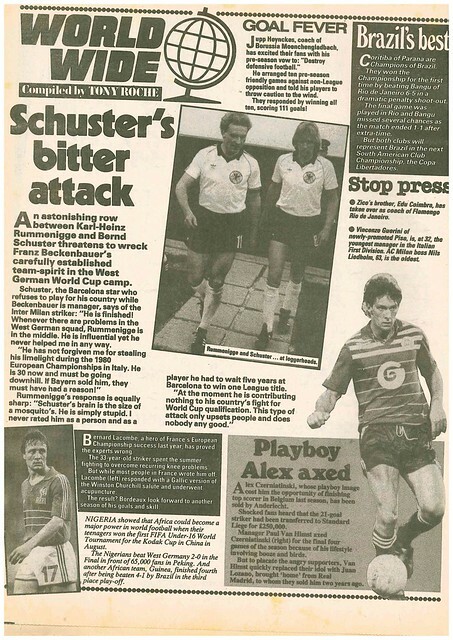 Ironically, the final group games weren’t played simultaneously in Spain 82, though that would change as a result of the Austria v West Germany game. 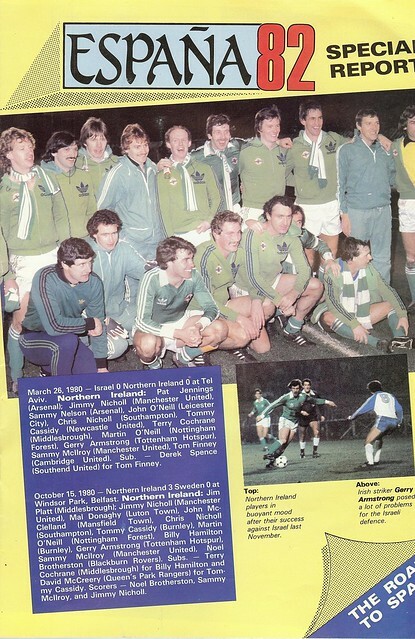 Honduras and Yugoslavia, two of Northern Ireland’s group opponents get a double page spread. 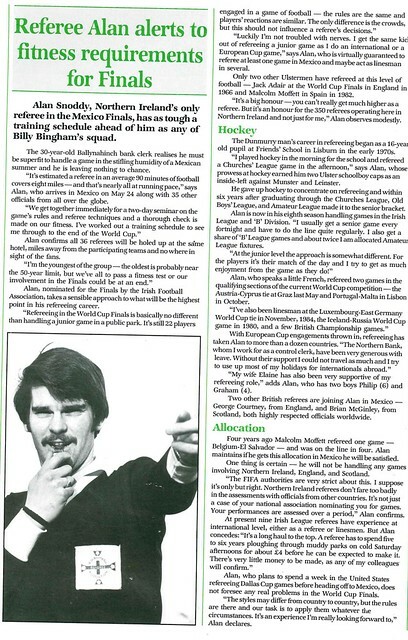 Not knowing much about the Hondurans, Northern Ireland are being helped by Terry Moore, a Canadian international who grew up in Northern Ireland, played for Glentoran, but in 1982, was playing for Tampa Bay Rowdies. 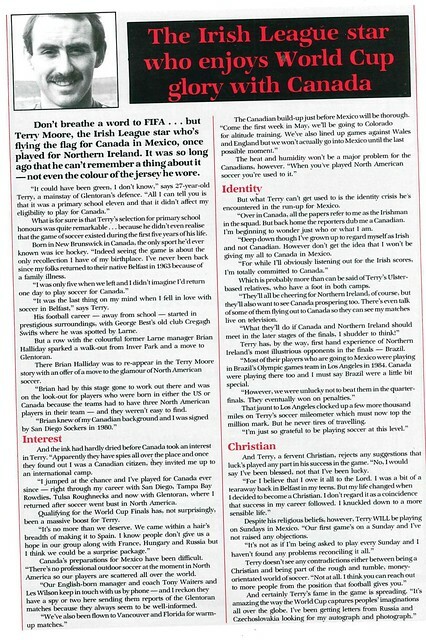 Honduras had beaten Canada for a place in the finals, with Moore bemoaning the fact that Honduras winner wasn’t disallowed for offside. 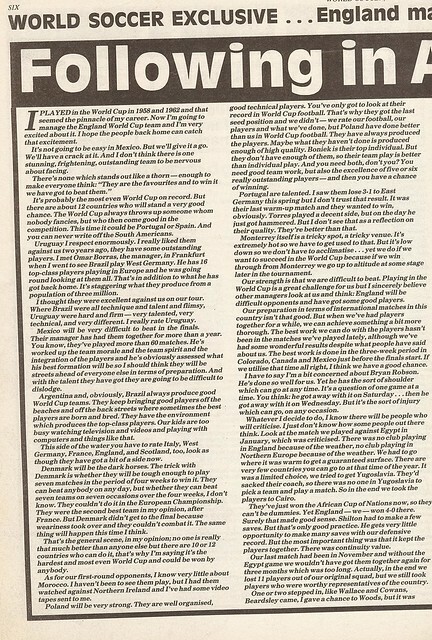 Moore would get the chance to play for Canada in the 1986 World Cup. 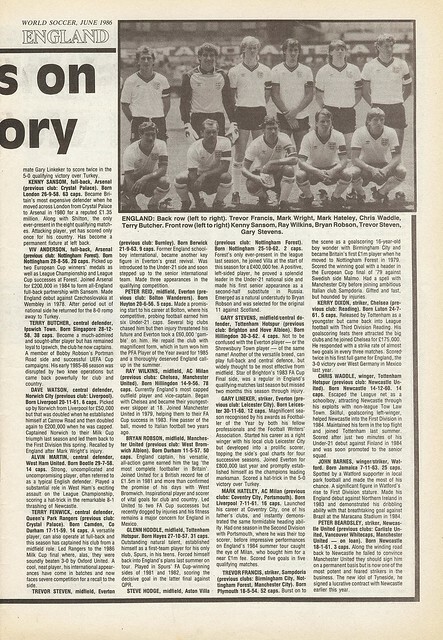 Moore would point out that it would feel like an away game due to the Honduran population in Spain, and that they would get support from locals for their games against Yugoslavia and Northern Ireland. 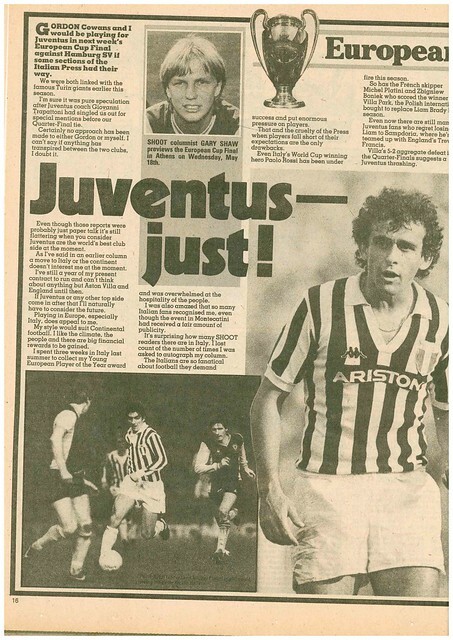 Apart from Nikki Jovanovic, formerly of Manchester United, not much was known of Yugoslavia, though there was an admiration for their manager Milijan Milijanic, in his second spell as manager, after winning two La Liga titles with Real Madrid inbetween. 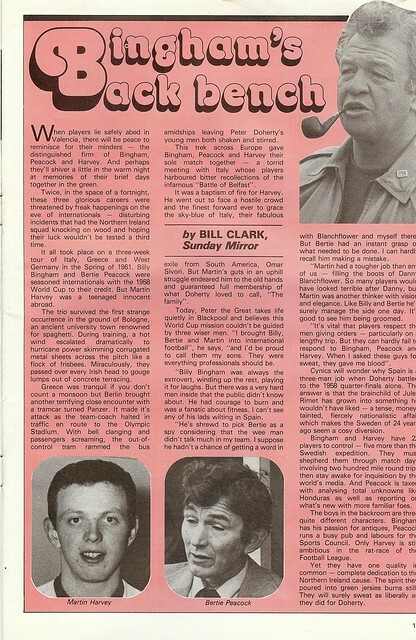 Bill Clark of Sunday Mirror pays tribute to the role played by two members of Billy Bingham’s backroom team, Martin Harvey and Bertie Peacock. 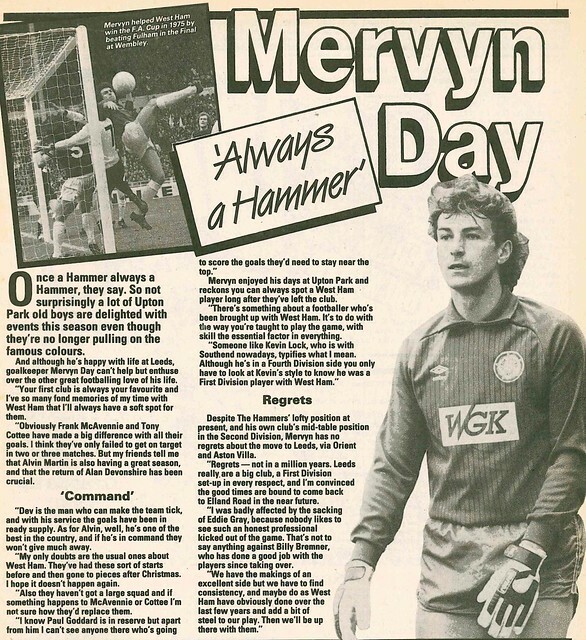 Some players are lucky enough to get full page profiles with the usual Q and A with footballers. 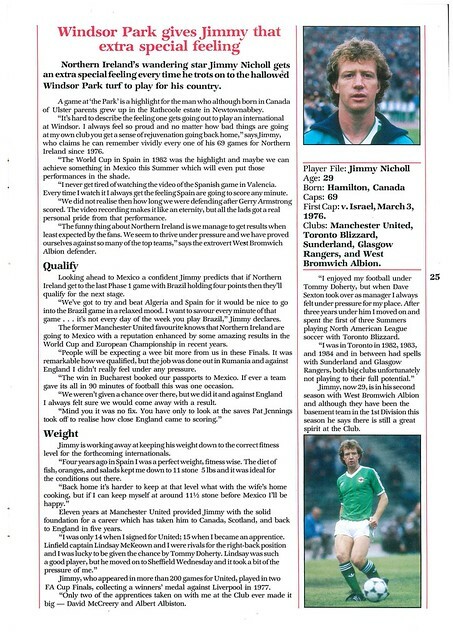 Sammy McIlroy was chosen by the UK government to front a “Behave yourselves” campaign (England and Scotland also qualified for Spain 82) but stated that Northern Ireland fans will behave, but that such a campaign was worthwhile. 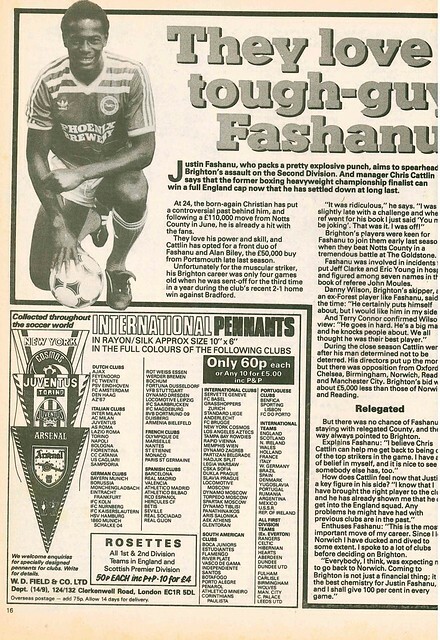 He also spoke about his transfer from Manchester United to Stoke City. 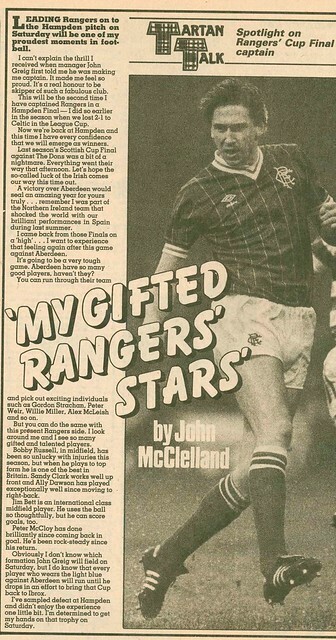 A former pupil of Mersey Street Primary School, his favourite football team growing up wasn’t in BT4, but across the city, as he supported Linfield, and Rangers. 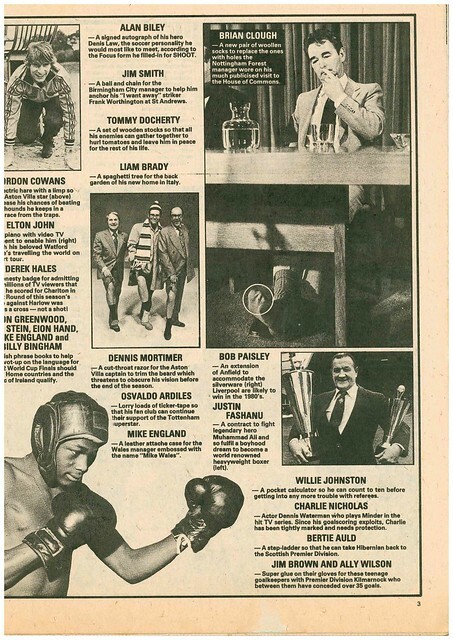 His favourite singer is Al Green and his favourite comedian is Tommy Cooper. 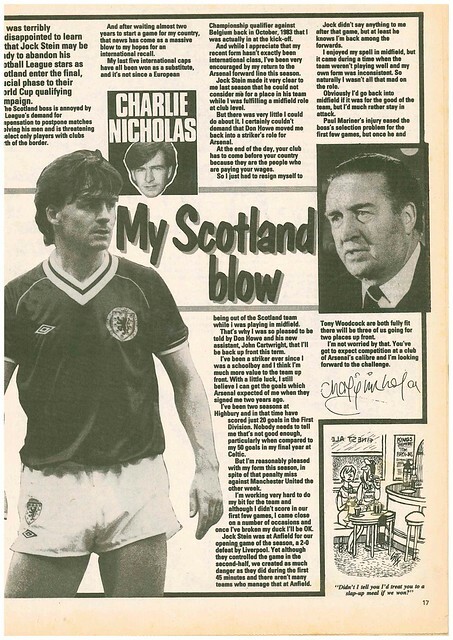 Chris Nicholl’s favourite singer is Mick Jagger and his favourite comedian is Benny Hill. 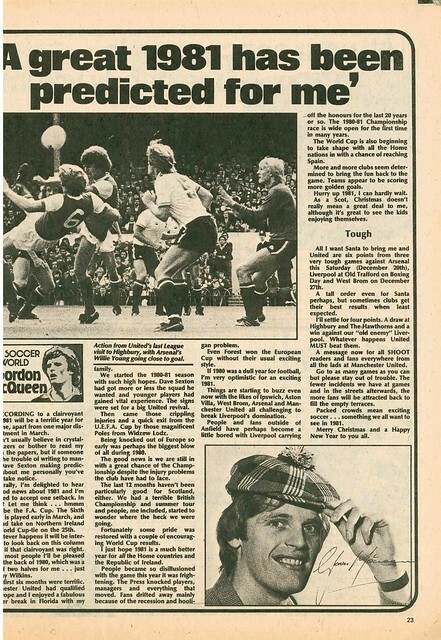 David McCreery is also a fan of Benny Hill, but his favourite singer is Rod Stewart. 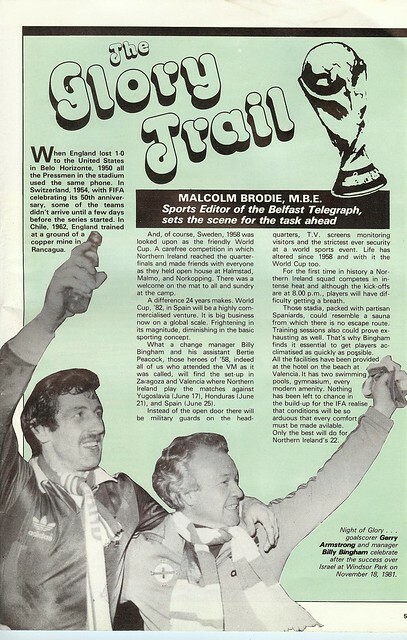 Despite fronting an anti-smoking campaign, Sammy Nelson admitted to having the odd cigar to celebrate Arsenal winning a trophy. 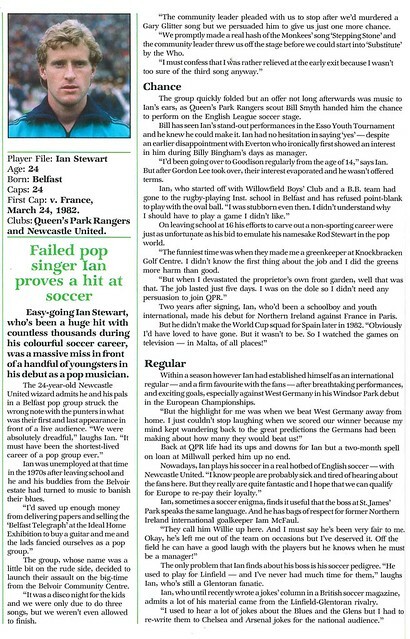 Interestingly, he was the first ever ex pupil of Inst, a school with a long Rugby association, to play international football. 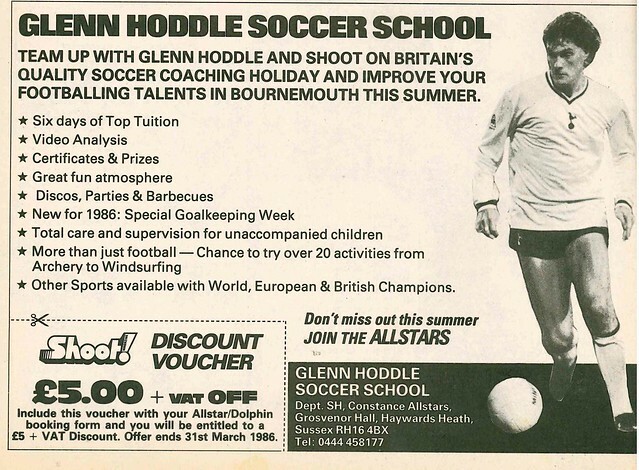 As of 1982, he was yet to be invited back to his old school. 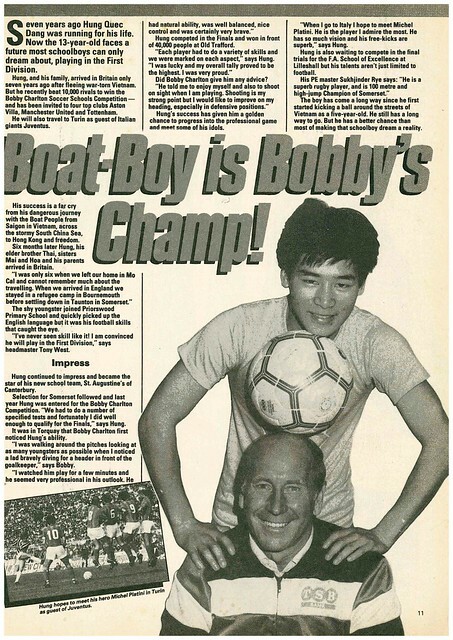 His favourite singer is Bob Seeger. 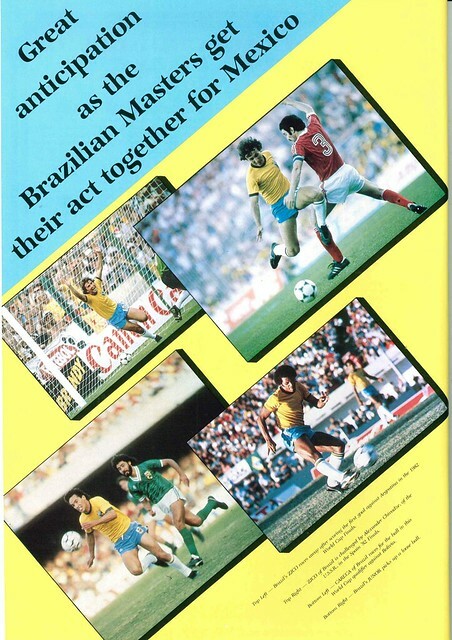 Mal Donaghy’s brother would be in Spain for the World Cup, but to cheer on Brazil, having formed the West Belfast Brazil Supporters Club. 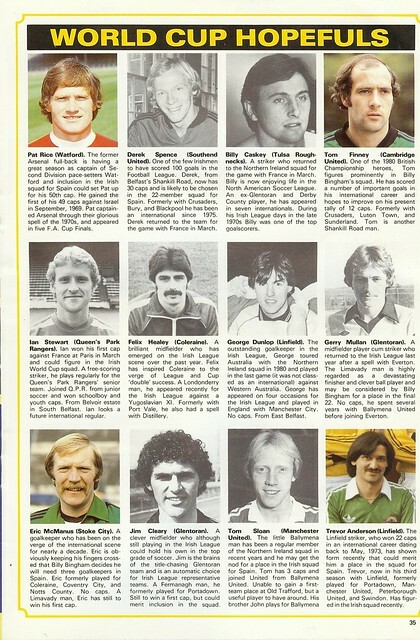 Ciaran Donaghy has played in the Irish League, most notably with Cliftonville. 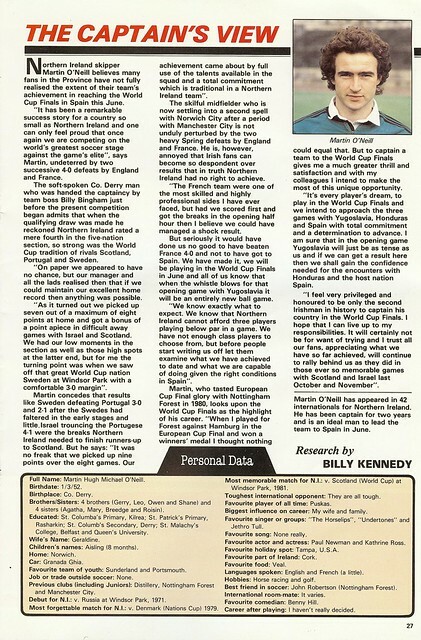 Billy Hamilton’s wedding anniversary fell during the 2nd Round of Spain 82, which he hoped he would still be in Spain for. 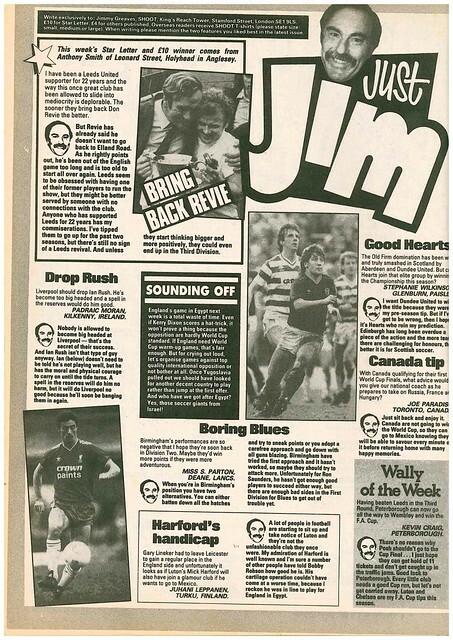 Like Sammy Nelson, who he lists as his favourite comedian, he is a Rolling Stones fan. 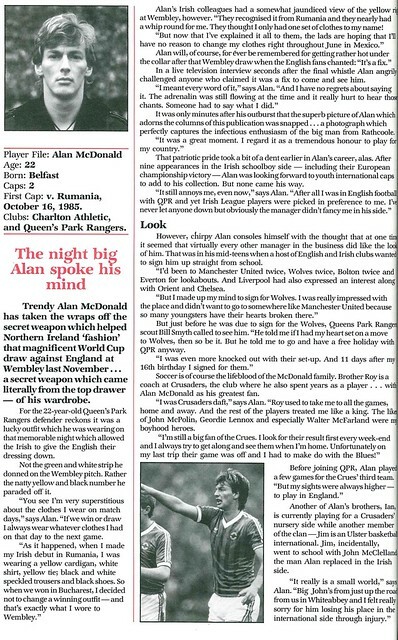 He states for his post football career, he hoped to own a business, which he did, setting up a Trophy and Engraving shop in Bangor, before selling it to Alan McDonald in 2009. 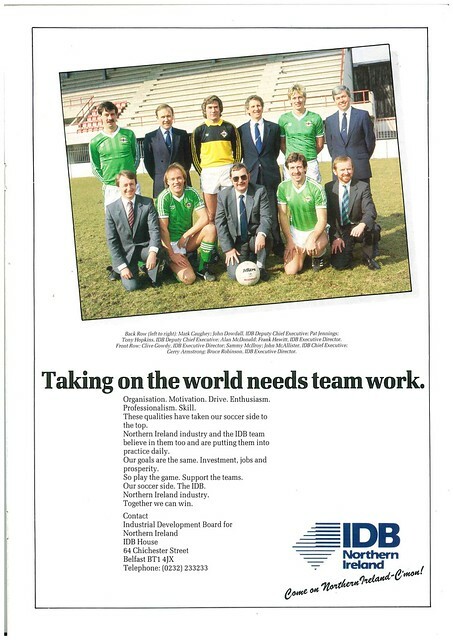 I think in 24 years on from 2006, they will still be talking about the achievements of 1982. 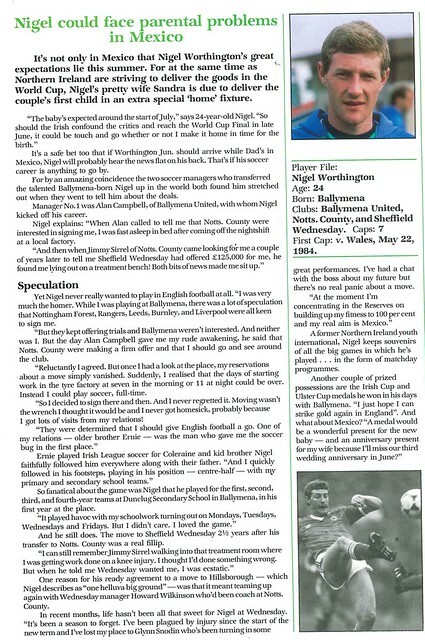 Ivan Little interviews sporting celebrities cheering on Northern Ireland such as Mike Gibson, Sean O’Neill, John Watson and Dermot Monteith. 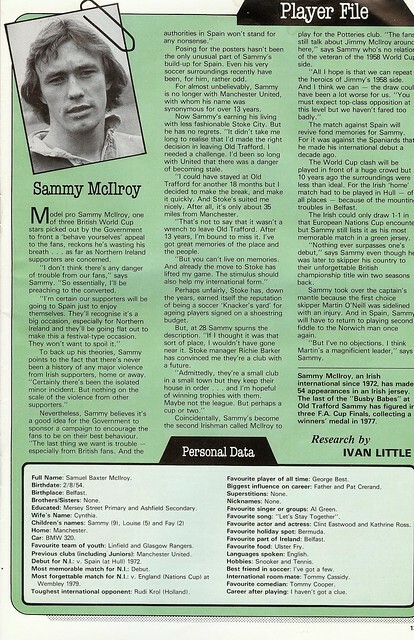 Alex Higgins is hoping that his Snooker schedule allows him to travel to Spain as a guest of ex Linfield player Sammy Pavis. 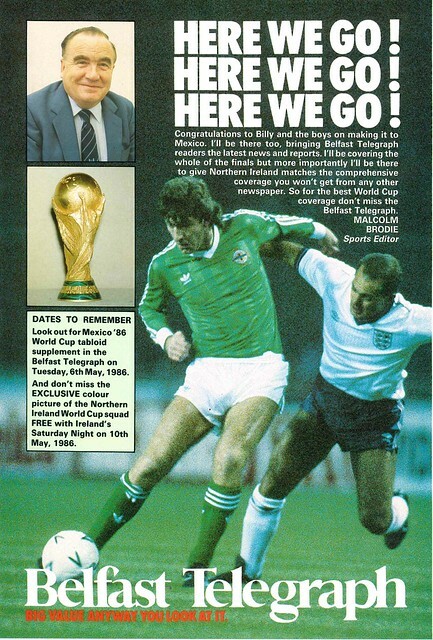 Martin O’Neill speaks of his pride at being captain, can speak a little French (unlike fellow Derry native Nadine Coyle) and his favourite bands are The Undertones (unsurprisingly), The Horselips and Jethro Tull. 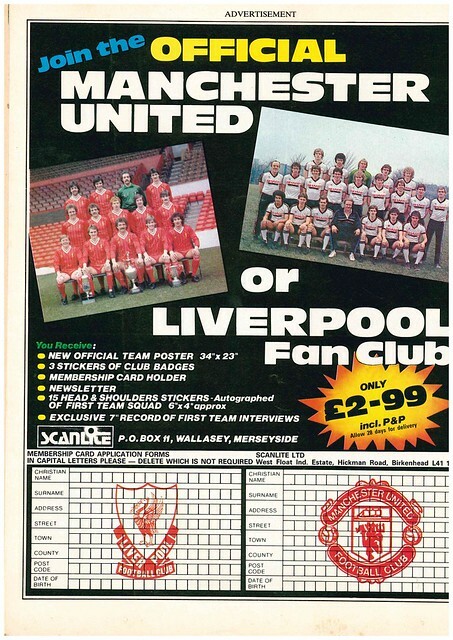 There is a team poster in the middle, while some players have their baby photos featured. 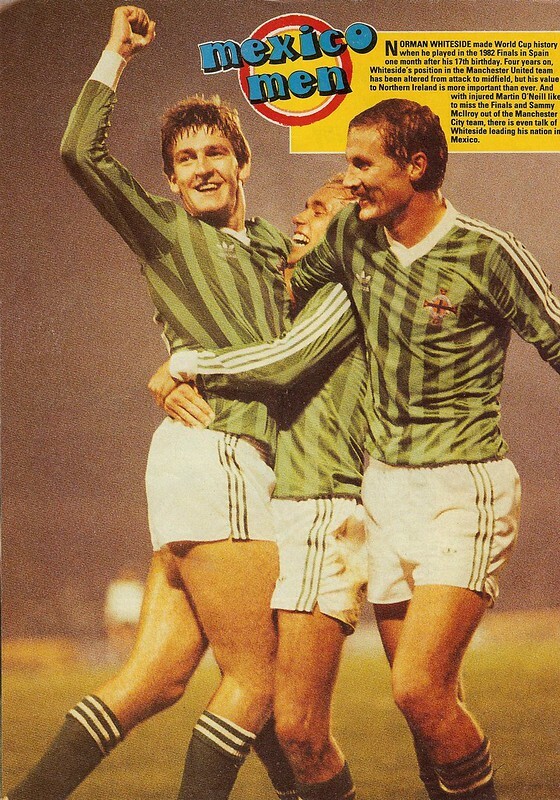 Pat Jennings spoke of his regret that physiotherapist Bobby McGregor, who died the previous November, wouldn’t be in Spain. 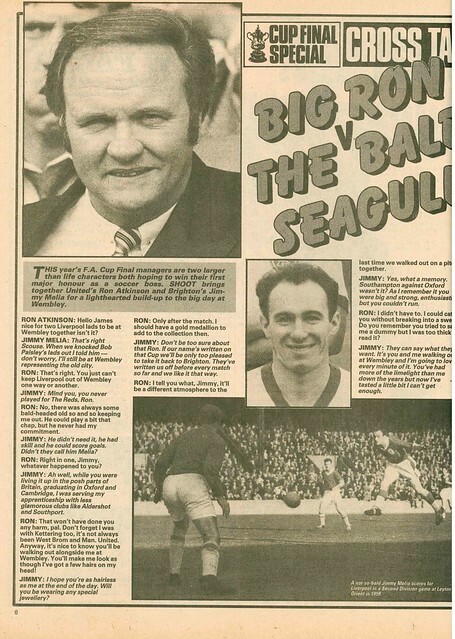 There is a full page feature on players on the fringe of the squad, battling for a place such as Pat Rice, George Dunlop and Tom Sloan. 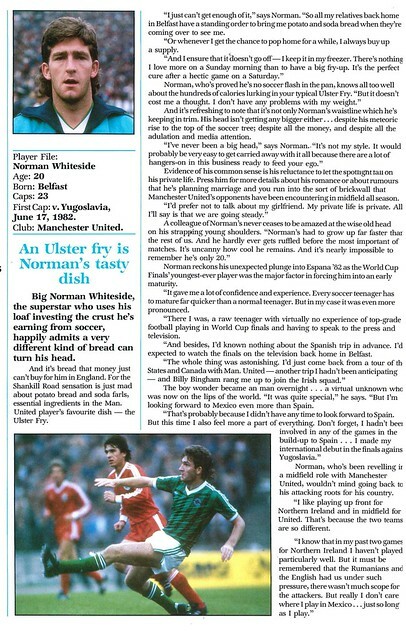 Interestingly, there is no mention in that article, or anywhere in the publication of Norman Whiteside, which would give an idea as to how late and unexpected his arrival in contention for a place in the squad was. 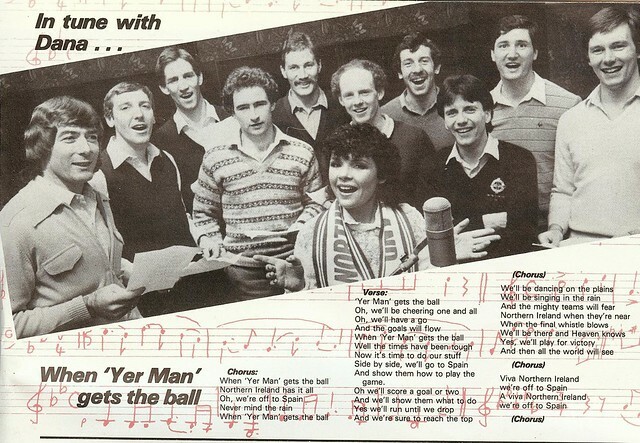 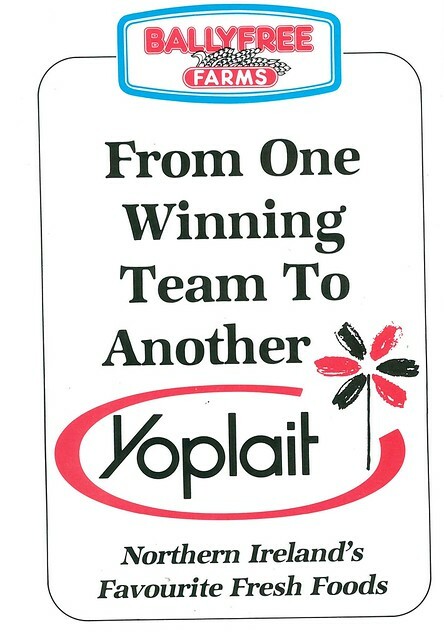 There is also a Smash Hits style lyric poster of the official team song, Yer Man, by Dana. 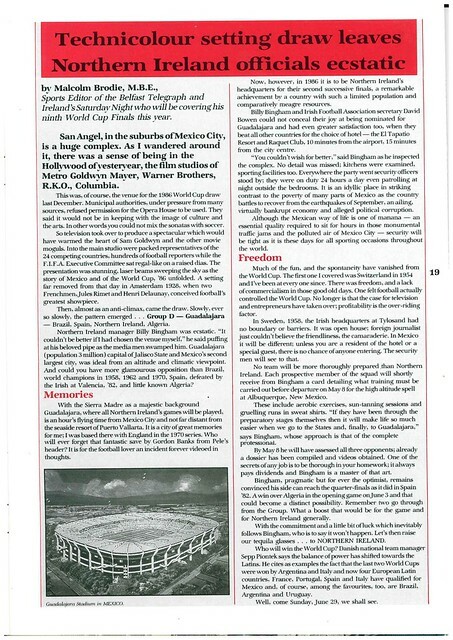 Sam Butler of News Letter writes a guide on what to do and not to do in Spain, warning fans that there will be a heavy police presence on the streets, and to beware of muggers. 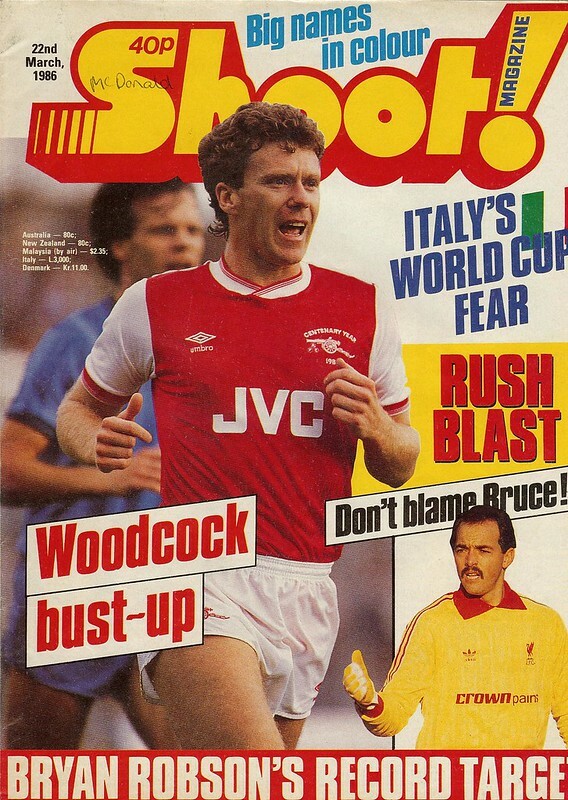 It’s 1986, and Tony Woodcock, in dispute with his club Arsenal, is the cover star of Shoot, as the 1985-1986 season reaches it’s final straight. 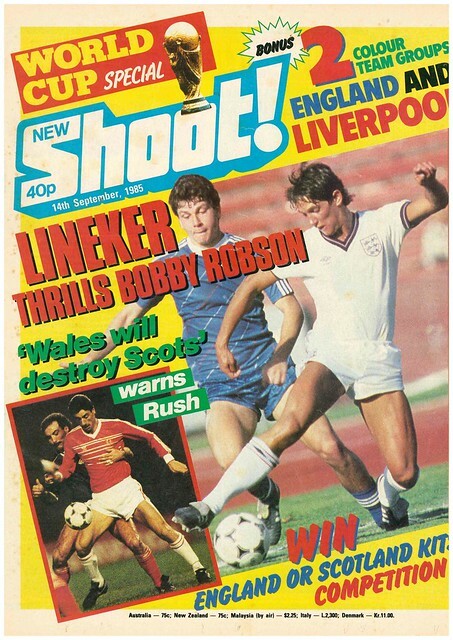 Robson fell short (by a bit) after retiring in 1991 with 26 goals. 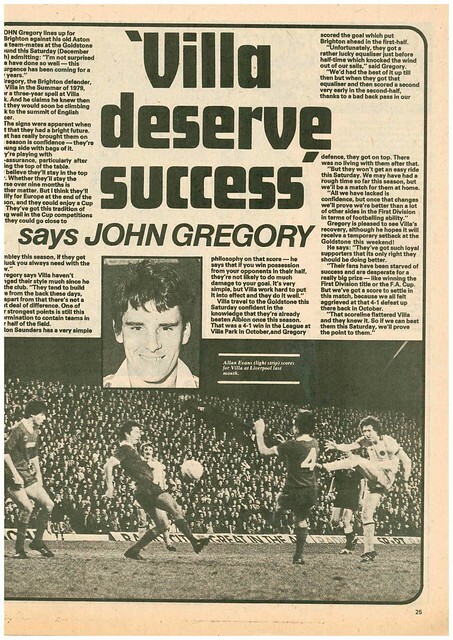 He did acknowledge that Gary Lineker had a more realistic chance of being England’s all time top goalscorer. 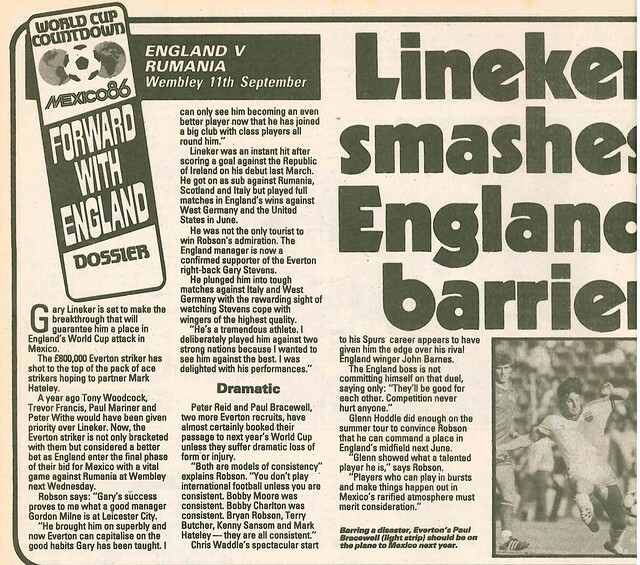 Lineker retired on 48 goals, just 1 short. 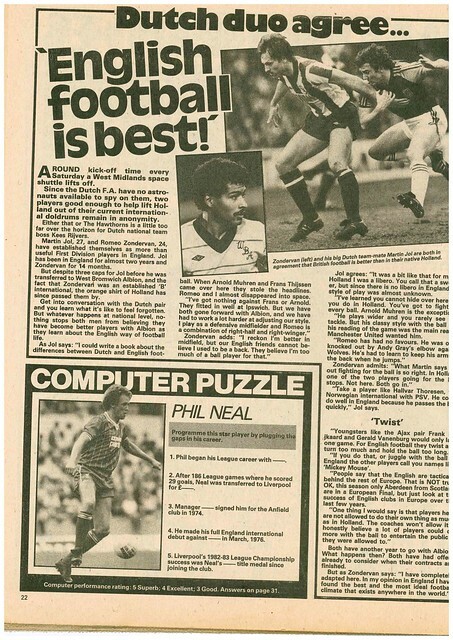 Trevor Brooking gets a double page spread to give his analysis of the five title challengers (Manchester United, Liverpool, Everton, Chelsea and West Ham United) and predicts that Everton will win the title. 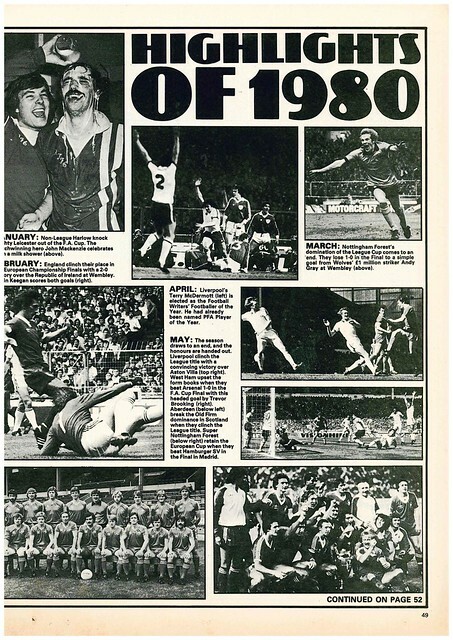 Liverpool ended up winning the title. 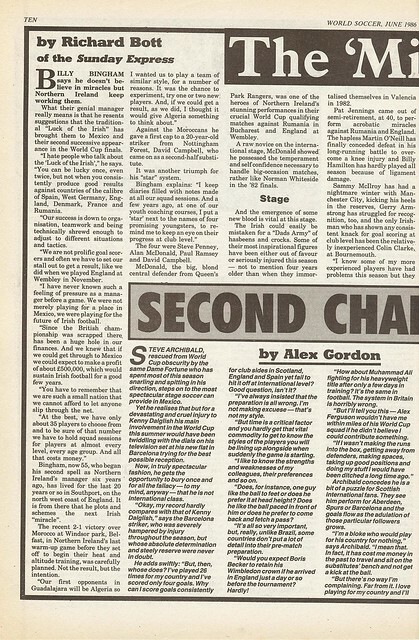 The letters prediction page predicts that Derby County, then in the Third Division, could be back in the First Division within two years. 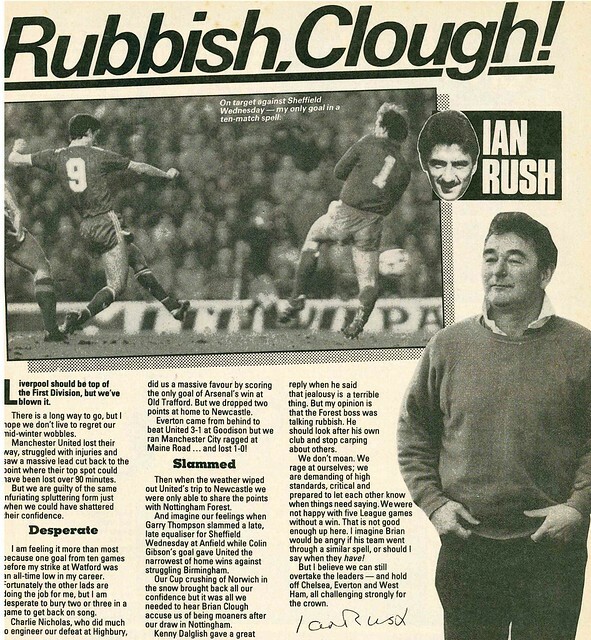 This was based on ambitious signings by manager Arthur Cox, who had made a bid for Nottingham Forest striker Nigel Clough. 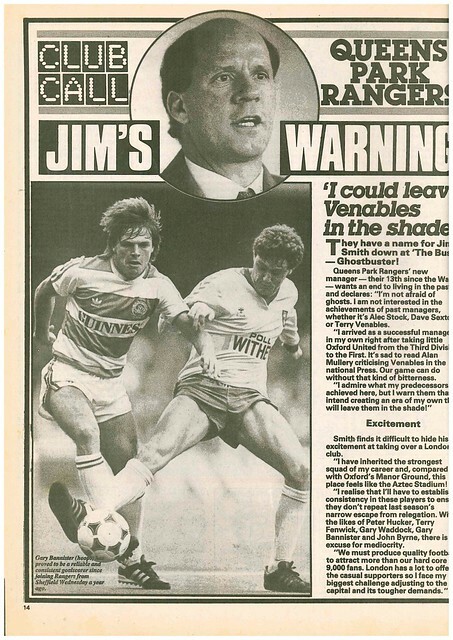 Derby were promoted to the top flight in 1987, and Nigel Clough did join the club ……… as manager in 2009. 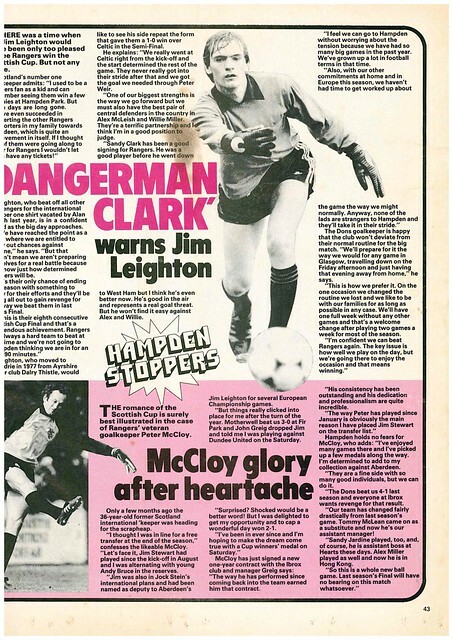 Jim Leighton is the subject of a player profile, where he revealed that he supports Rangers, and worked in a Dole Office before becoming a footballer, and that his favourite bands are Queen and U2. 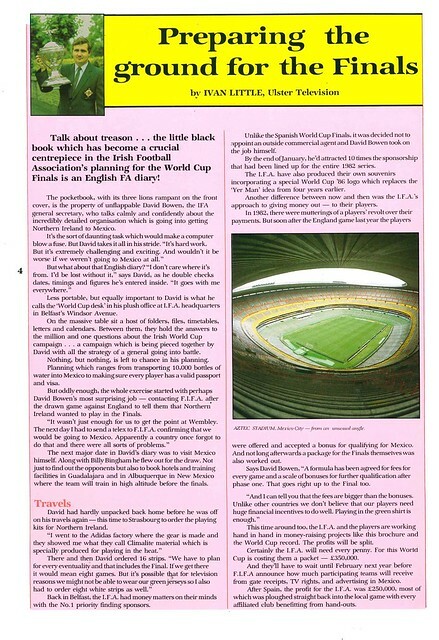 The countdown to the World Cup is on, and includes an interview with Rachid Harkouk, a Londoner of Algerian descent playing for Notts County, looking to break into Algeria’s squad. 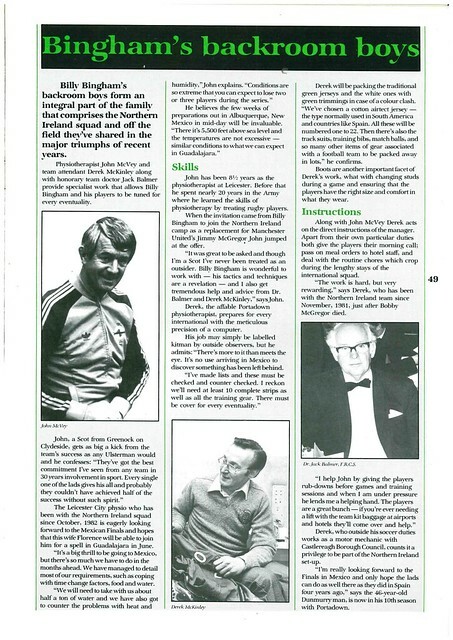 Pat Jennings, nearing the end of his career, gets a page of tributes from former team-mates such as Pat Rice and Bill Nicholson. 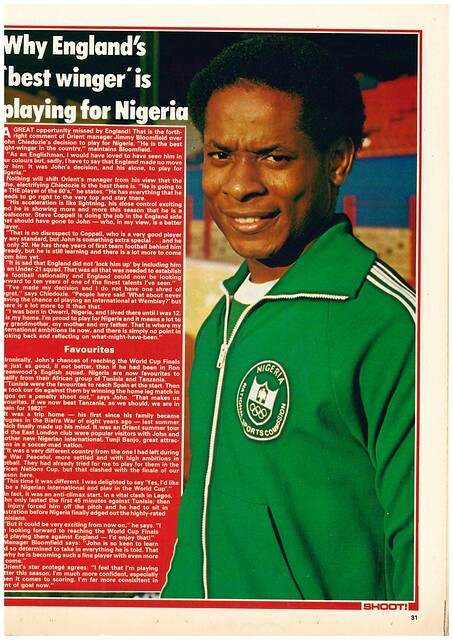 Jennings ended his career later that year, playing his last game in June, on his 41st birthday against Brazil in the World Cup. 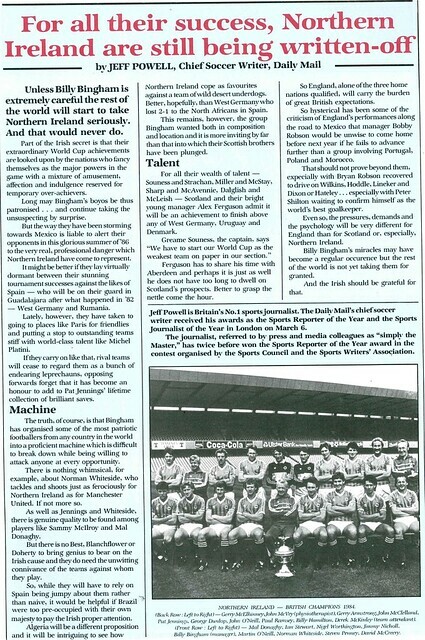 Talking of Northern Ireland, Ron Soldi from Wollongong writes to Jimmy Greaves to ask why Northern Ireland don’t include George Best. 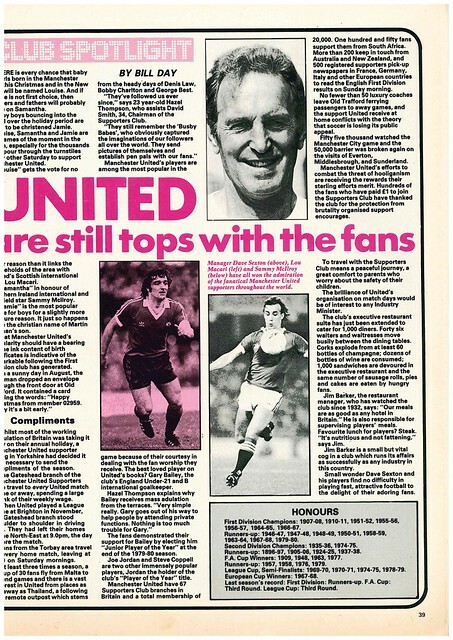 Despite being 40 when the tournament starts, and not played a competitive match in 2 years (for Tobermore United), Jimmy Greaves agrees with the letter writer. 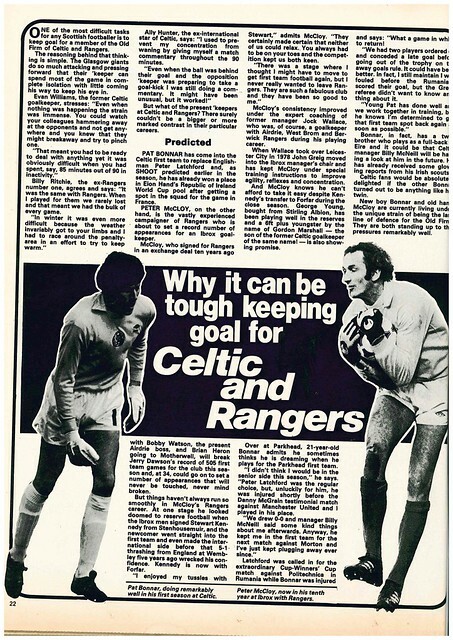 The big game of the weekend in Scotland, Celtic v Dundee United, gets a full page profile. 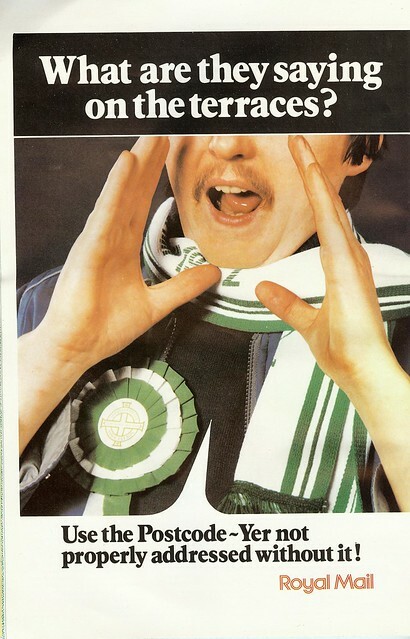 Celtic won the league that season on Goal Difference, with Dundee United finishing third. 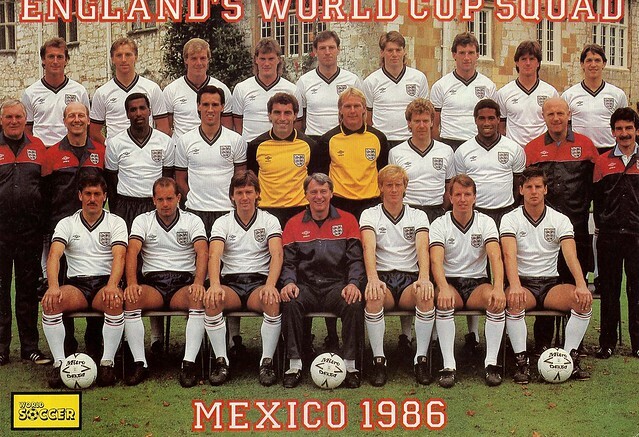 On the back cover, there is a poster of Norman Whiteside, Sammy McIlroy and Billy Hamilton celebrating a goal, with the headline ‘MEXICO MEN’, as the World Cup gets closer. 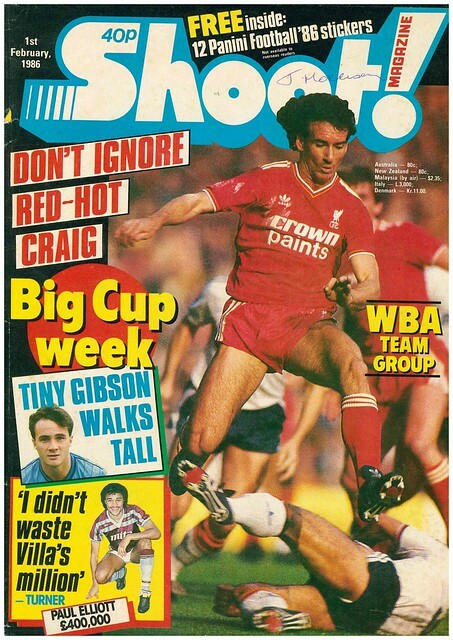 World Cup preview edition complete with a free colour picture of the England team. 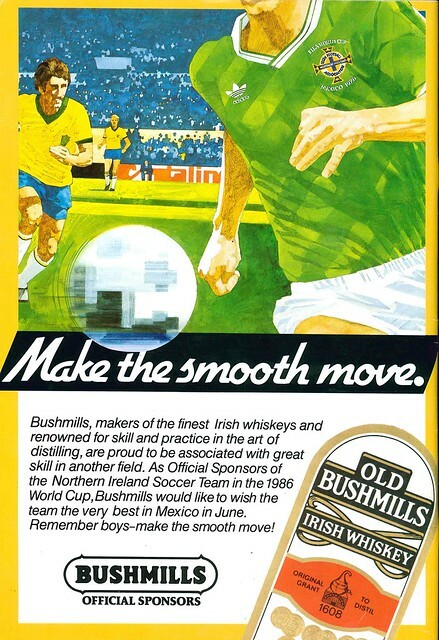 Though not of Scotland and Northern Ireland. 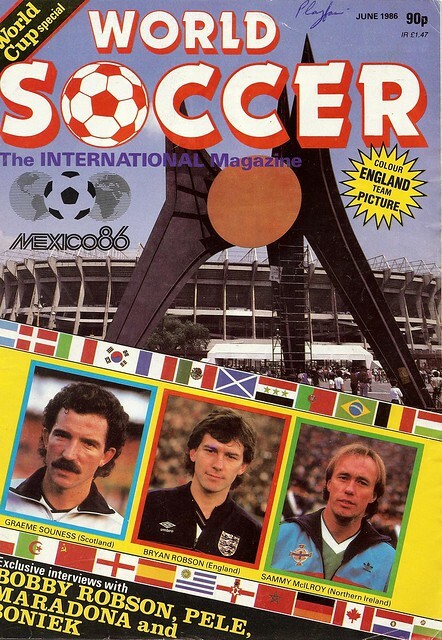 The front cover features the Aztec Stadium in Mexico City, the venue of the final, and images of Graeme Souness, Bryan Robson and Sammy McIlroy, who captained Scotland, England and Northern Ireland at the finals. 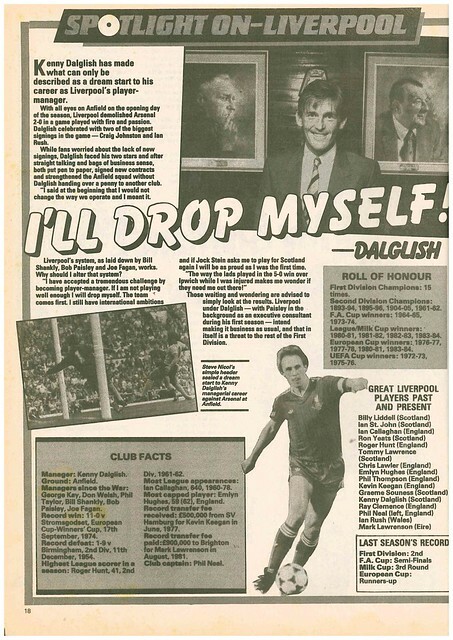 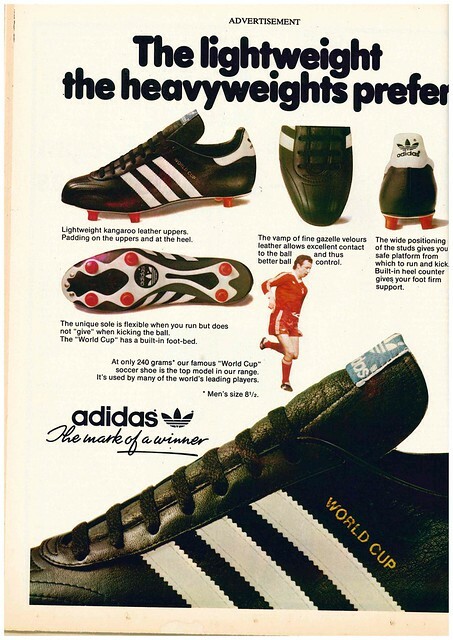 The editorial focuses on Kenny Dalglish’s regret that he was injured and unable to play in the 1986 World Cup. 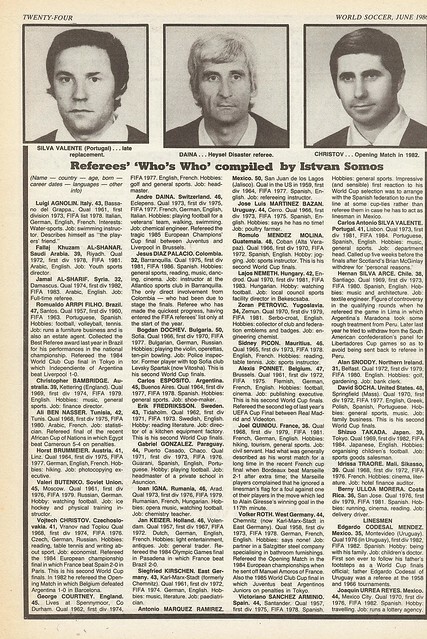 Meanwhile, Valery Lobanovsky was dramatically appointed manager of the Soviet Union after the previous manager was sacked after a run of bad results. 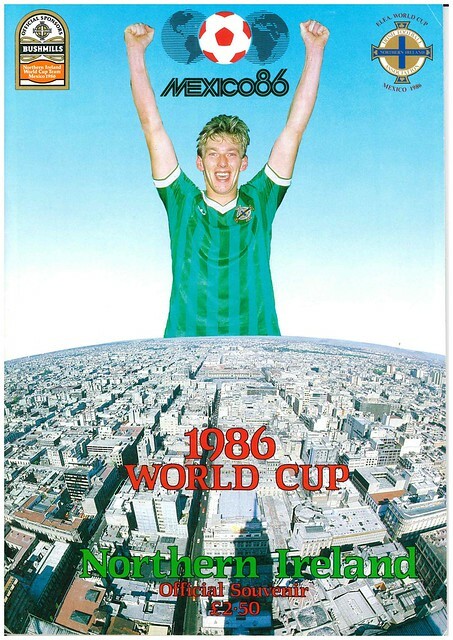 Lobanovsky led the Soviets to the Second Round in Mexico, and then to the final of Euro 88. 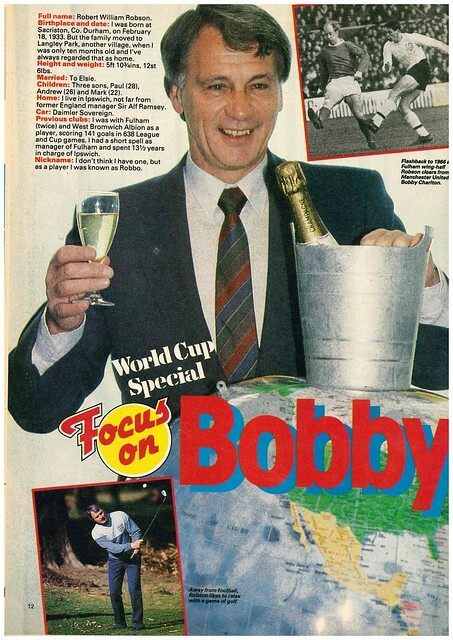 Having twice won the European Cup Winners Cup with Dynamo Kiev, he led them to the Semi-Finals of the European Cup in 1999, before his death in 2002. 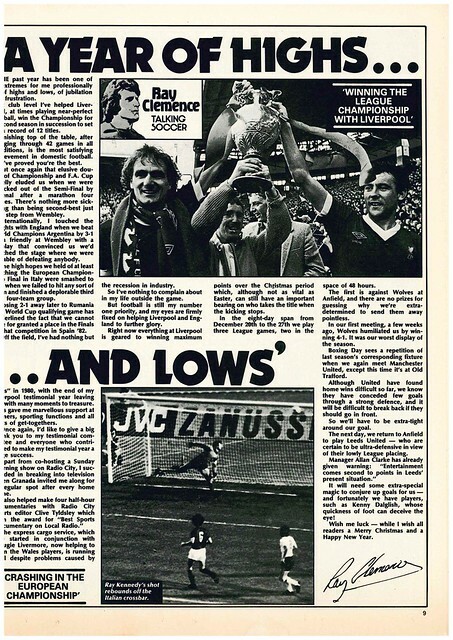 Dynamo Kiev’s stadium has since been renamed in his honour. 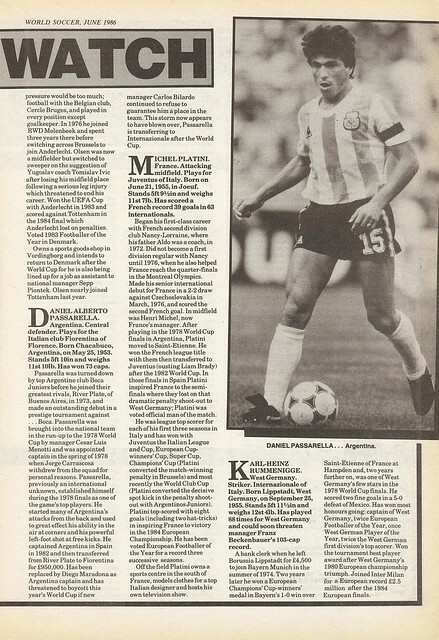 Diego Maradona was interviewed and named England as his dream opponents should Argentina reach the final. 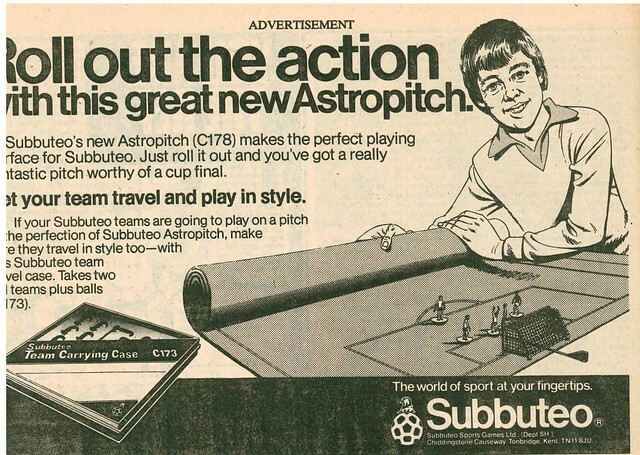 They had to make do with a Quarter-Final meeting of course. 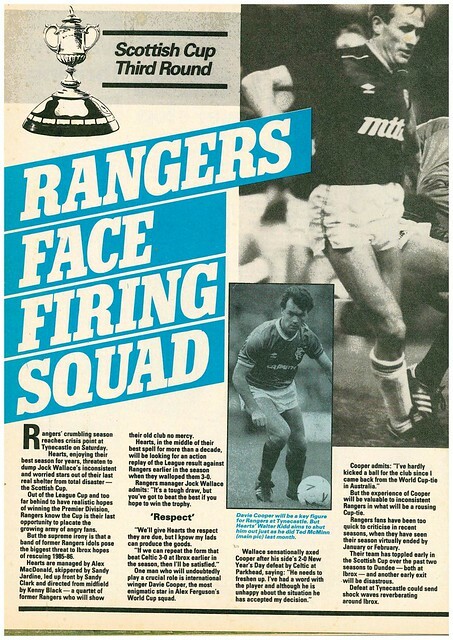 Due to print deadlines, the squads were announced after the publication date, so they had to guess the squads. 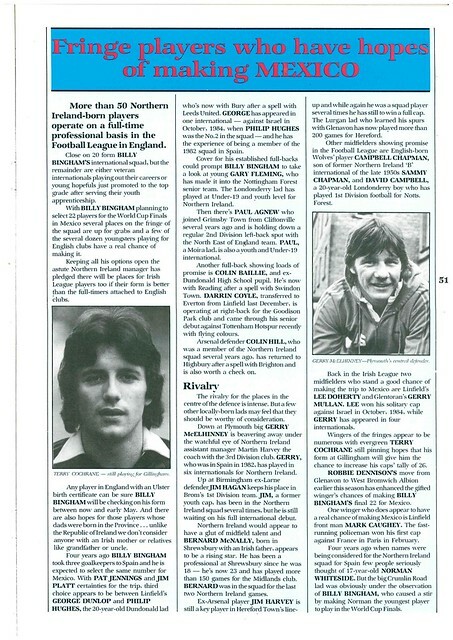 Northern Ireland’s squad includes Martin Caughey of Linfield, which was clearly a typo as the writer seems to have got Mark Caughey and Martin McGaughey mixed up. 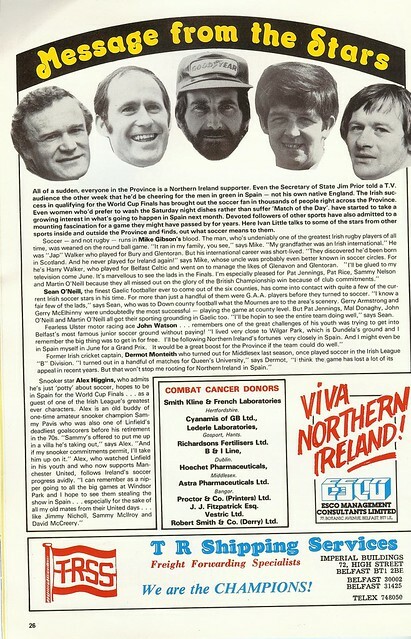 George Dunlop, also of Linfield was also listed. 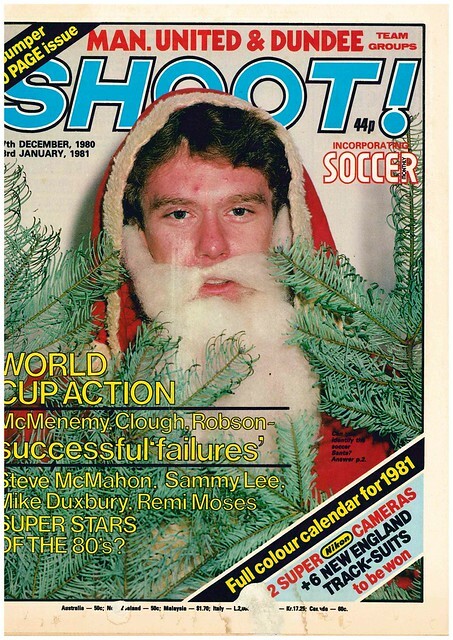 He failed to make the final cut. 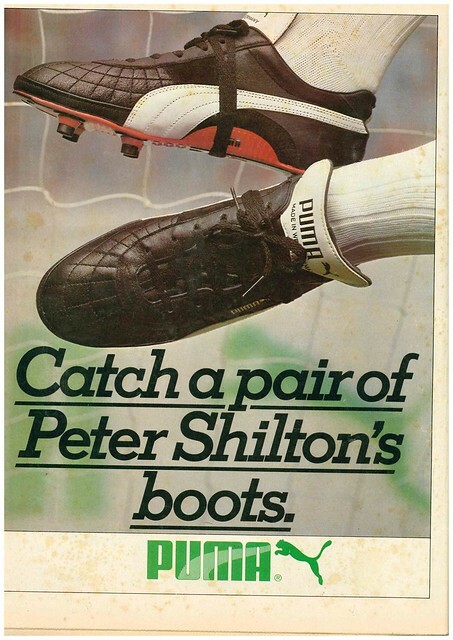 Bizarrely, Bury’s Philip Hughes doesn’t have a date of birth listed. 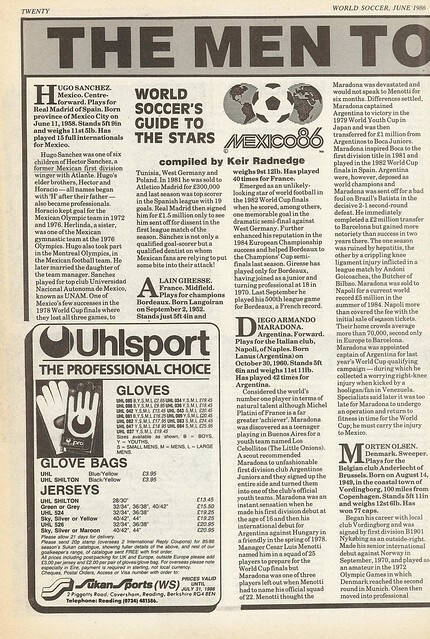 The only other Irish League player at the 1986 World Cup was not in the Northern Ireland squad, but Canada, Terry Moore of Glentoran. 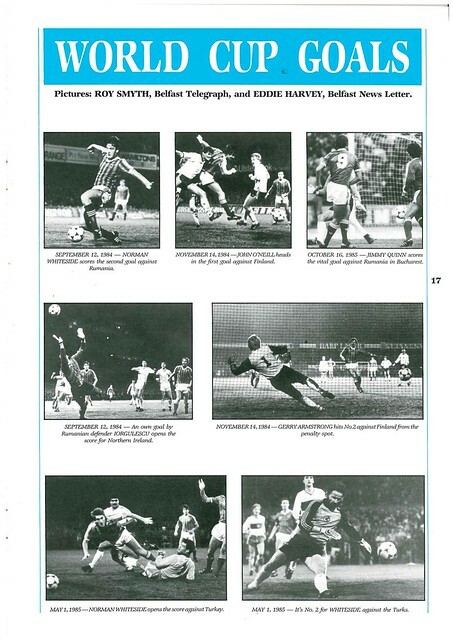 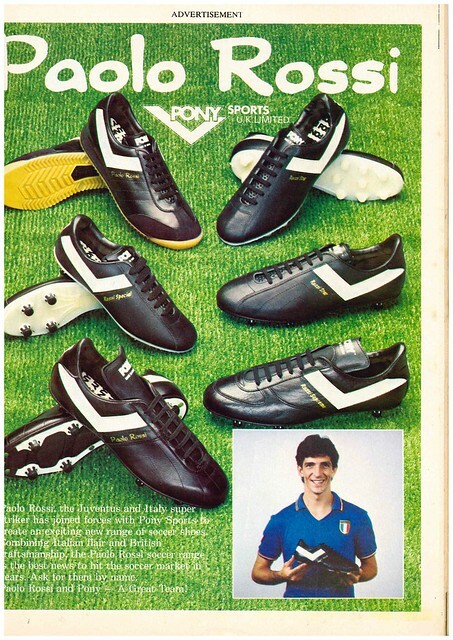 The European Cup final gets a double page spread, which is quite impressive for a 0-0 draw. 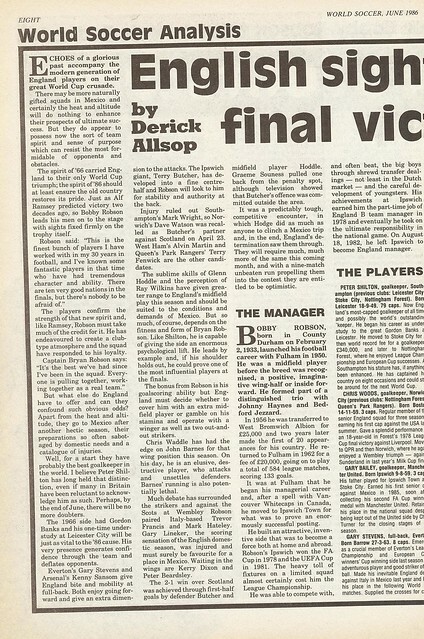 To set the scene for English readers, it begins by imagining an unknown Eastern European team has beaten Manchester United in the European Cup final at Wembley, which was strange considering United hadn’t won the league in 19 years at this point. 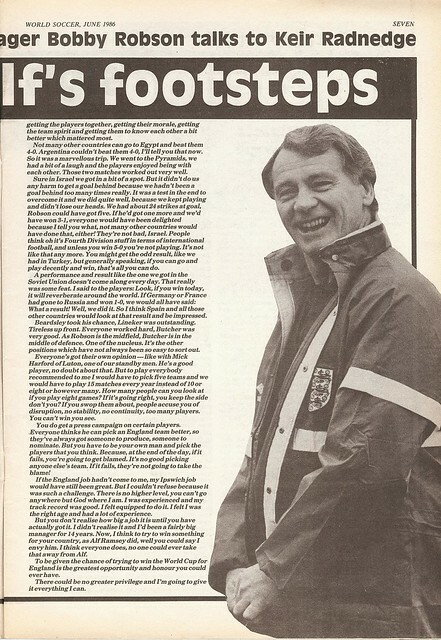 Brian Glanville’s column is very pessimistic about England, Scotland and Northern Ireland’s World Cup chances claiming that Bobby Robson isn’t the man to lead England, and suggests that if Billy Bingham was England’s manager they would do much better. 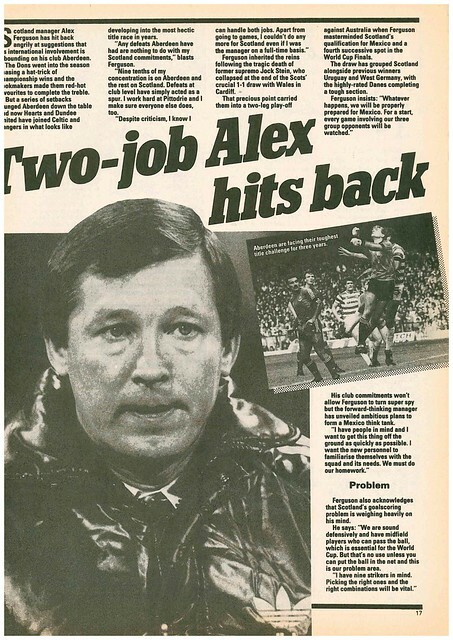 Alex Ferguson, despite winning a European trophy with Aberdeen “has done nothing yet at international level to convince me of his qualities” despite the fact he’d only been Scotland manager for less than a year. 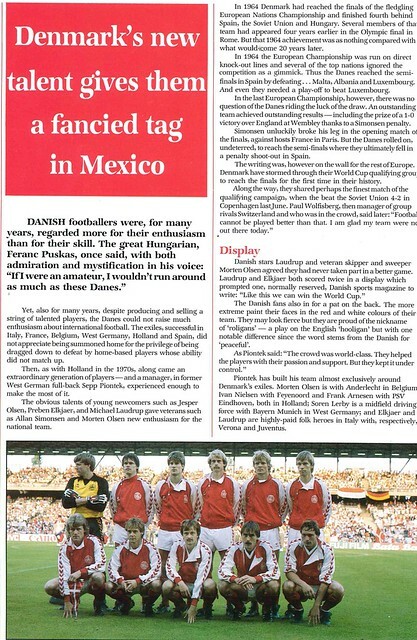 Could be an accurate description of English football in 2011.